Apple's Beats Solo3 are on sale once again, but this time the price is the lowest we've been able to spot to date. First off, it's worth mentioning that Apple is still selling these wireless on-ear headphones for $330, while many retailers like Amazon and Best Buy offer them for $300 when they're not on sale. 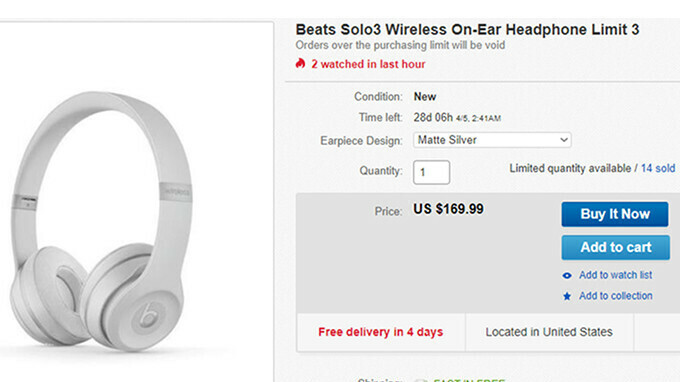 The good news is Newegg's official eBay storefront is selling Apple's Beats Solo3 headphones for just $170, nearly half the price that other major retailers are asking. It's the lowest price to date for this pair of headphones, so if they're on your shopping list, now would be a good time to grab them. To make things even more appealing to customers, Newegg has several color variants up for sale on eBay: Black, Gold, Rose Gold, Gloss White, Gloss Black, and Matte Silver. On top of that, shipping is free anywhere in the United States, so make sure to check out Newegg's promotion before the retailer runs out of stock. How is it half price? I think you have messed up studio with solo, studio is about 300USD while the solo has been about 200usd for a while, even on amazon it’s 200USD.